I love mud between my toes on a hot summer day, at the edge of the sea, pants rolled up above the knees. I love being a child again, up to the elbows and ankles in mud. I’m digging for clams to steam for tonight’s supper on the beach—although you don’t have to dig in the mud with your bare hands, like I do! Most people wear rubber gloves and boots and dig clams with a 4-tined rake called a hoe. My father used one of these, and a wooden slatted basket called a roller. Digging clams was his main income during good weather, along with raking blueberries. We ate a lot of clams in the 1970s, and they were also a lot more plentiful then. Clam landings drastically declined across Maine in the 1980s, especially in Washington County. 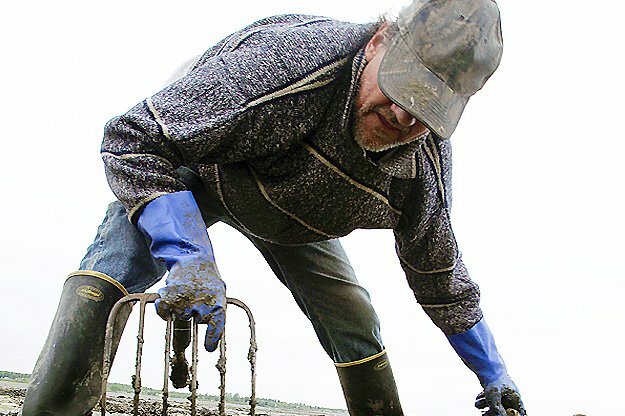 Today, the clamming industry is kept alive by the careful management of coastal Maine communities, including the seeding of clams to enhance wild stocks. The Downeast Institute for Applied Marine Research & Education located on Beal’s Island, raises between three and five million seed clams annually for 60 Maine communities. The Downeast Institute offers guided tours of their shellfish nursery. More information is available at www.downeastinstitute.org, or by calling George Protopopescu at 207-497-5769. Clams have always been a staple resource to the people of the Downeast region. Shell heaps from native settlements are scattered along the coast, including at Machias, Passamaquoddy, Cobscook, and Frenchman Bays, and at Bar Harbor (in Wabanaki, the “clam-gathering place”). The Massachusetts Colonial Ordinance of 1641-1647 granted every household “free fishing and fowling as far as the tide doth ebb and flow”, and Maine retained this law when it became a state in 1820. To learn more about clam digging past and present, check out the Downeast Fisheries Trail. Clams for supper! I can’t think of anything more perfect than stoking coals at a beachside cook fire with friends, seaweed wrapped around those fresh-dug clams steaming up a scent of toasted ocean; with the sunset and moon over the water, as a rising tide slowly swallows our footprints in the mud flats…or, as folks around here refer to them, the clam flats. 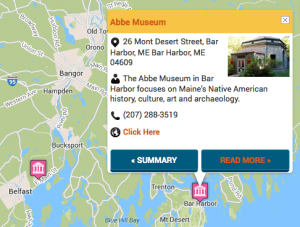 To learn more about how to experience digging and eating clams while on your visit to Downeast Maine (even if you want to skip the mud and just eat them at a restaurant! ), contact an area Chamber of Commerce Information Center. Knowledgeable chamber staff will help you discover your fresh-harvested seafood supper experience of a lifetime. Don’t want to go alone? In the Bold Coast region of Maine, contact Tours of Lubec and Cobscook for a family-friendly, touchable tour. Or ask any local if they know someone who will take you! If you are going alone, check with a local town office regarding licensing requirements and for the best places to dig. Video Description: I took a trip up to Cutler, Maine for this past year’s 4th of July weekend and frantically tried to swallow up as much of the atmosphere as possible. 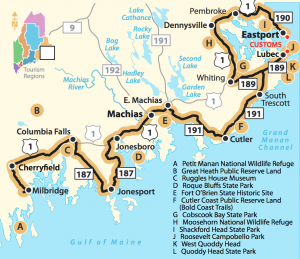 I got to adventure around Cutler, Lubec, Machias, and Machiasport; witnessing what is famously know as the Bold Coast. The area is overflowing with countless breathtaking views, is brimming with lighthouses, and delivers the feeling of an undisturbed connection with your surroundings. In additional to visiting the landscape, I also got to experience the holiday with a bit more local intimacy. I witnessed all the Cutler traditions of the 4th, some of which included crate races, a parade (which I ended up riding in! ), and fireworks. The entire town has such a charming, small-town personality. I brought a camera along and tried to capture a bit of the weekend and this is the result.